Foundations for Teaching English Language Learners: Research, Theory, Policy is a welcome addition to the literature that addresses a critical need for up-to-date information that will serve as a valuable resource for teachers who are preparing to or already work with English language learners. One of the unique features of Foundations is that it brings together content related to policies and programs for ELLs, but also situates the discussion about meeting the needs of ELLs within the context of other instructional debates, mandates, and issues. By including content related to literacy instruction for ELLs, Foundations not only addresses a critical issue for ELLs' success in school, it also highlights how national and state instructional mandates impact the instructional context for ELLs and often serve to perpetuate compensatory educational models. Foundations for Teaching English Language Learners is organized around general themes that are critical to understanding how best to meet ELLs' needs. The comprehensive chapter on language and education policy for ELLs offers a historical perspective that will help teachers better understand the basis for current educational policies and practices, including those that support and restrict language usage in today's classrooms. The extensive description of federal policy effectively contextualizes the ongoing debate regarding instructional practices for ELLs. Chapter 7 extends that dialogue to include the debate over how best to teaching reading and what that means for ELLs. One of the major strengths of the book is that it expands the discussion to highlight connection between reading and second language acquisition. The focus on knowledge about reading for ELLs adds important content that will help teachers understand the relationship between language proficiency, success in reading, and academic achievement in general. In addition, the focus on specific reading strategies provides an excellent link from theory to practice, which teachers in today's changing classrooms so desperately need. Foundations for Teaching English Language Learners provides a host of pedagogical features that can be used to engage different levels of graduate students, e.g., post baccalaureate students obtaining licensing and M.A. students. As an instructor who will use this book in a future class, I see the inclusion of both discussion questions and research activities as a major benefit that will assist me as I prepare my class sessions. The specific focus on technology resources as well as the links to the web and online discussion boards within each chapter also serve as a welcome addition to the text. 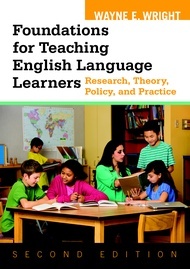 Overall, Foundations for Teaching English Language Learners: Research, Theory, Policy is an outstanding new text that will be welcomed by faculty who work with future and current teachers of ELLs. It is well organized, easy to read, comprehensive, and expands on current policy and research texts to include practical strategies for teachers to use in their own classrooms. I look forward to using this book in my own courses. From the broad socio-political perspectives to promising classroom practices, this book addresses all the key aspects of education needed to understand, plan, and carry out engaging learning for bilingual students. Issues, previously covered in other literature, are presented with a fresh and current perspective. Reader friendly, this book is a must for all educators. Wayne Wright integrates the forces of history, policy, culture, theories of language and linguistics, pedagogy and practice, and measurement as they come together to shape the educational trajectories of English learners and other language minority students in U.S. schools. This compelling new volume is a must-read for educators, researchers and students interested in the education and achievement of students learning English. Bravo, Wayne! This book integrates numerous examples from research to illustrate key concepts, and provides frequent detailed descriptions of effective teaching practices with explanations of why they work for ELLs. It places issues within their sociocultural and political contexts to enable readers to understand the broader implications of educational policy and practice. The author uses clear, comprehensible language to distinguish valid research findings from the misinformation often reported in the media. His presentation style cuts through the fog and ambiguity found in most textbooks, and offers readers a solid grounding in the pedagogical practices best suited to second language learners. I want to congratulate Wayne Wright on producing such a high quality, comprehensive, and useful text. I cannot wait to use it in my future offerings of our "language development for CLD students" course! I have been piecing together chapters and articles from various resources to come up with what I felt was a fairly complete reading list for my students, and have changed it every semester because I was simply not satisfied with the lack of cohesion, cohesiveness, and completeness of what is currently available. Wayne has done a marvelous job of putting together a text that is comprehensive, relevant, and timely; incredibly well-written and organized, and [perhaps most importantly,] accessible and useful for supporting preservice teachers' understanding of schooling/educational issues for ELLs. The companion website is an exciting feature which will keep the book current and will serve as an important resource for both faculty and student users.